The forecast said sunshine and showers between 11 am and 12 today, but arriving at Kings Pond near Farnham, it was already raining as I tackled up before 10. A strong wind was also getting up, so I had stopped at the first peg, where there was a bit of bankside cover. 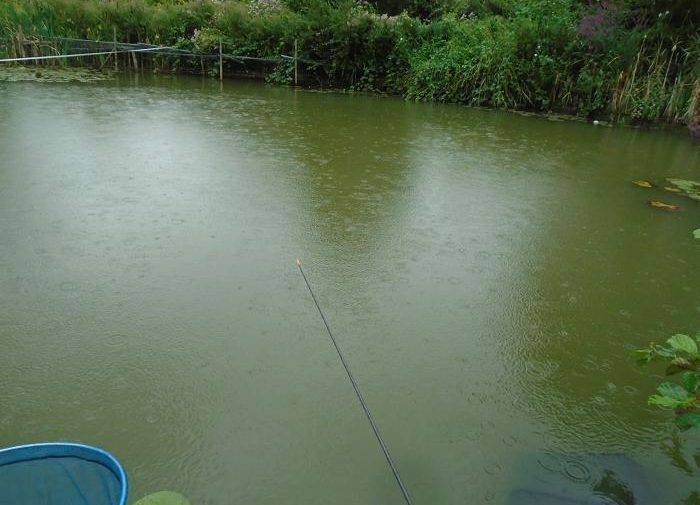 Preferring not to fish under a brolly, I put on a large waterproof hooded jacket, which when sitting on my box, drapes over my legs. This was enough for any shower and anyway it’s summer, the rain is warm isn’t it? 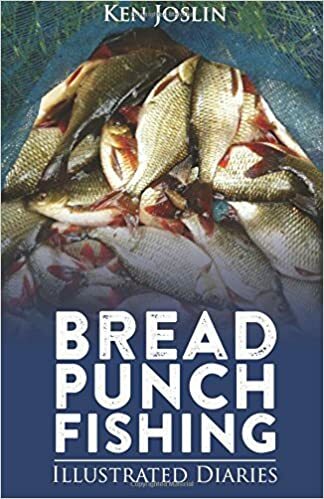 The main problem was that, fishing the bread punch, I needed to keep my punch bread dry, so I part filled a bait box with liquidised bread for feed and cleared an area to punch the quarter slices. Replacing the lid each time. I squeezed up a couple of balls and put them over the shelf into 4 ft of water. The bottom here is clean sand and I plumbed the depth to fish just on bottom. I started with a 5 mm punch on a size 16 hook, but was plagued by small roach sinking the float each time. 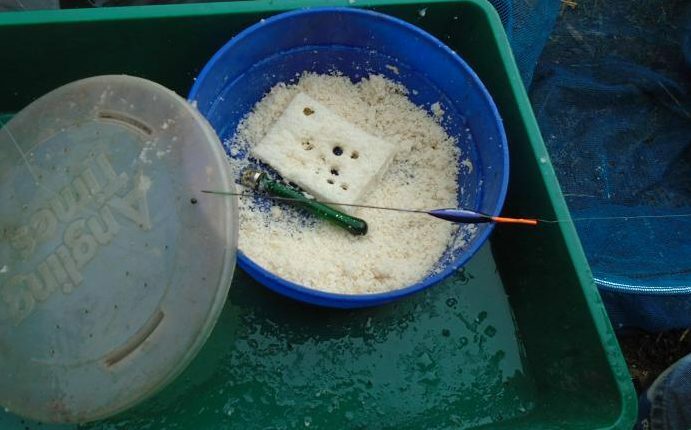 Rain was increasing, making bite detection difficult and switched over my rig from a 4 x 14 float to a 4 x 16 with a slightly thicker antenna and a size 14 barbless hook, going up to a 7 mm punch pellet. This worked, the float being more visible and I watched it hold down a couple of times before sinking beneath the rain lashed surface. Lifting in, the elastic came out as the fish kept deep out of sight, until close to the net, a crucian carp popped up to the top. Not a monster, but this is what I came for, the pond noted for it’s crucians and tench. I was beginning to have my doubts though, a passing angler on his way home, complaining that he had been there since 6 am without a fish. The pond had been dead during the heatwave and he had hoped, like me, that the recent rain would perk things up. He was using pellets, I was on the bread, which in difficult conditions gives me an edge. The elastic was out again, this time a nice roach coming to the net. 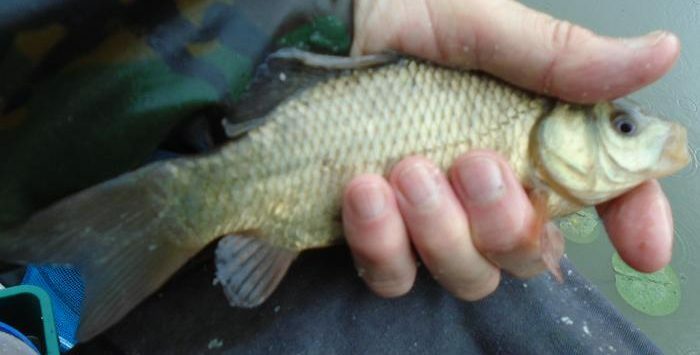 The larger pellet of bread was still being attacked by small roach and I was surprised, when a lift bite saw the elastic stretching out across toward the opposite bank, this fight different to a roach or crucian. Soon this fish was on the surface, its dorsal fin clear before sliding into the net. This was a very shiny fish, a brief appearance of the sun glinting off its scales. 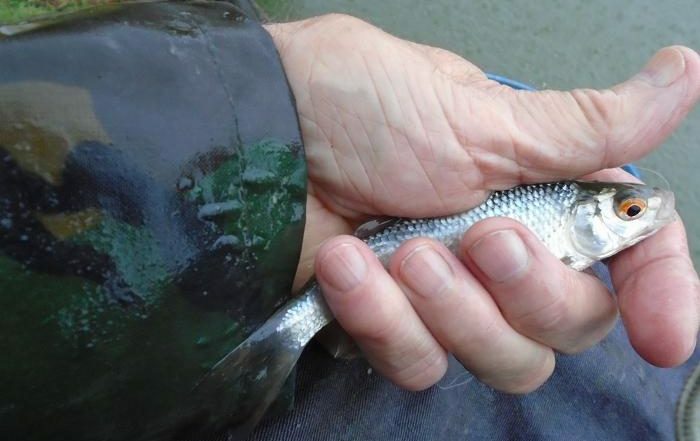 It was very pale, more like a silver bream, roach hybrid, than the usual roach bream hybrid. It may have been a european ide, the Farnham AS even stocking barble into this pond, so why not ide? The sun was short lived, the wind increased and in the distance could hear thunder rolling towards me, then flashes of lightning. The rain hammered down again and I hunkered down beneath my hood. The first I knew that the float was gone, was the elastic zooming out of the pole tip heading for the lily bed opposite. 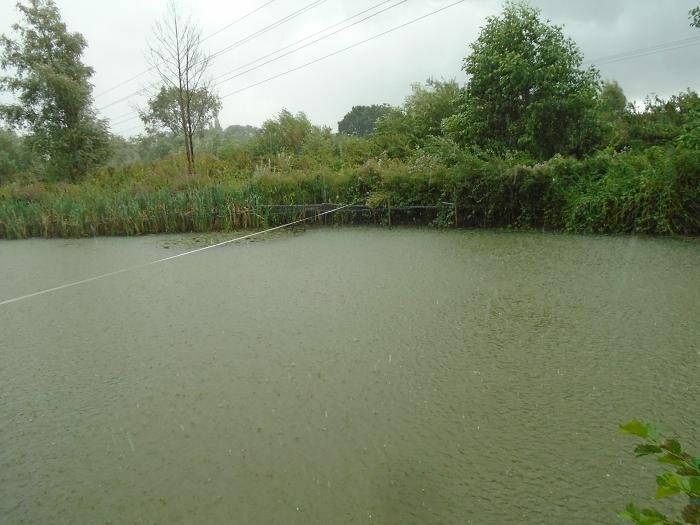 This was a carp, or one of the fabled barble and I turned the pole to counter the run, the pole bending round. The fish rolled, then headed back in my direction and came off. What a let down, a decent sized fish would have been a just reward for sitting out in this storm. 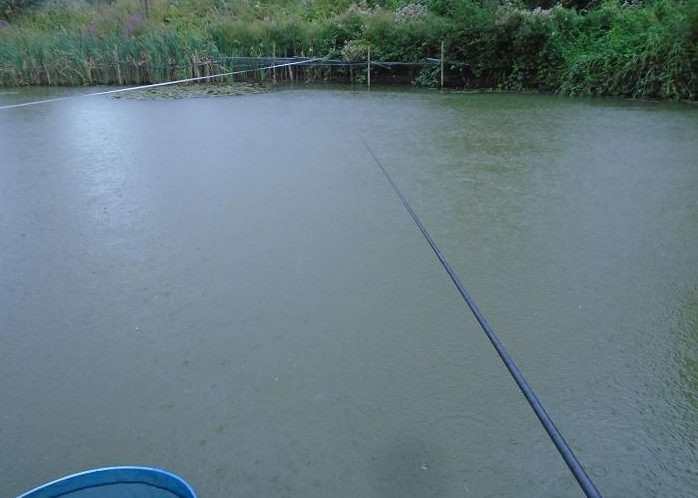 The hook was still there and I baited up with another three balls spread out in front of me, then sat out the worst that the weather could throw at me. The wind eased and I dropped the float over the baited area, the float sinking away after a minute of dithering. 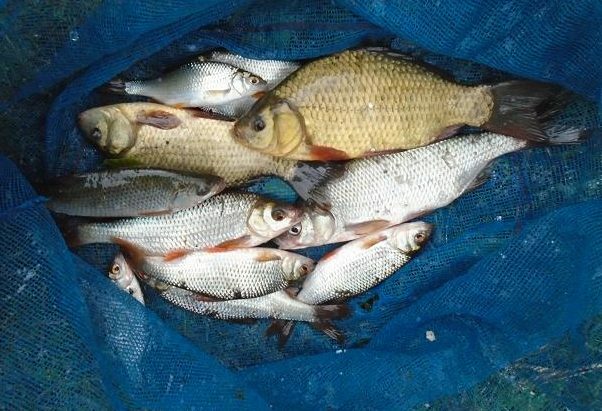 This time I was back in control as a decent crucian fought deep under my feet, the hook dropping out in the landing net. I made no mistake about the next bite, a broad healthy roach powering away, pulling out the elastic. The wind began gusting, with steady big rain drops hitting the surface and I could hear thunder in the distance. When the float went down, I decided that this was going to be the last fish, another roach coming to the net. As the rain began to pound down, I tried to pack up, the storm arriving like a tornado, with thunder, lightning and hail. The storm was overhead and feeling vulnerable I retreated to a bush, that gave some shelter from the wind, but no protection from a lightning strike. With the rain now running from my jacket soaking my legs, I began throwing bits of tackle into bags. I would sort it all out later. Pulling my net from the water, it now felt warm to the touch, tipping my fish into the landing net for a quick photo, before returning them. Walking back to the van, the sun came out again, but too late for me. Arriving home early, my wife spoke of one short five minute shower at 11 am, while I had suffered all morning. At least the weather forecast was right for somebody.